Mediation - our Director and Associates have between 16 and 24 years of experience in providing mediation to a very wide range of clients in a wide range of fields of dispute. Conflict Coaching - We have a small team of experienced Conflict Coaches who provide this pioneering new approach to supporting the resolution of conflict in any area of human interaction via 1-to-1 work with individuals involved in difficult situations . Conflict Management Training - We provide a range of training and consultancy options for organisations from in-house mediation training to training of individuals in mediation skills, conflict coaching skills as well as training groups in 'Managing Conflict in Teams, 'Dealing with Difficult Situations', 'Committee Skills Training' and many others. All of our training, conflict coaching and mediation practices are informed by the CAOS Underlying Philosophies and Practical Principles of Communication originally described on the Communication and Conflict website. Neighbour disputes, where a resident may have difficulties with their neighbour over issues such as noise, parking, pets behaviour, high hedges, boundaries etc. Workplace disputes where two colleagues may have considered starting or have even started to become involved in Grievance procedures about each other and decide that they'd like a less formal way of resolving their differences once they realise the level of stress Grievance procedures can lead to and the time and distraction they can cause from their normal work activities. This approach to alternative dispute resolution provides a confidential 'safe space' for those involved to talk through the difficulties they are having with a well trained, experienced mediator individually at first to explore whether there may be more effective ways of responding to the situation that supports themselves and supports resolution of the difficulty. 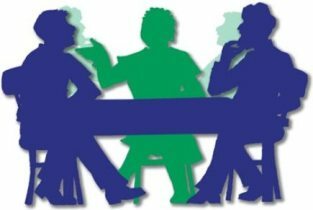 This may then involve a 'Joint Mediation Meeting' with the other(s) with whom they have a dispute to enable both / all to work co-operatively in the confidential environment of a mediation to create a better way forward in the situation. The mediator is not an 'authority' who decides what the outcome should be, they are a skilled facilitator who supports constructive, effective communication to occur and they also use a particular approach to questioning that supports creative thinking by those involved such that they are able to consider and create new ways of dealing with their situation in future. This form of alternative dispute resolution is often described as 'non-adversarial' and 'co-operative' as it supports those who have previously been in dispute to move away from 'winning against' the other person in the situation and towards 'winning with' the other person in that both participants are supported in creating an outcome that works for them. Contrary to many beliefs about this, a mutually satisfactory outcome from such disputes is often possible when the focus of energy devoted to the situation is towards mutual listening and shared creativity. This approach to alternative dispute resolution (ADR) has only emerged during the last decade and the CAOS Model of Conflict Coaching was developed via a pilot project in 2008 when the present Associates at CAOS worked for a community mediation service in West London. Click this link - What is Conflict Coaching? 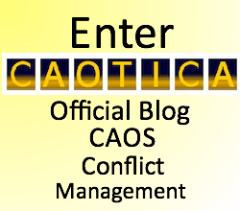 - to find out more about the development of this project and the model we use at CAOS Conflict Management. We provide Conflict Management Training based on our experience in the above alternative dispute resolution practises. As practitioners in this field we are able to observe common behaviours, beliefs and communication practises that are either supportive of the resolution of conflict or serve to escalate its destructiveness and so we use these observations to inform the conflict management training we provide in a range of different areas. Click Conflict Management Training for links to further information about our training. However these are adversarial processes meaning that someone other than those directly involved will propose or sometimes impose a 'solution' to the dispute and so the disputants will strive to persuade the relevant third party (Adjudicator, Arbitrator, Ombuds) of the 'rightness' of their position and the 'wrongness' of the other's position. While there are clearly appropriate uses of these processes they are not ones which we provide at CAOS Conflict Management.